As one of the members of Chinese big family, Tibet is a special region located in the west of this boundless area. Owing to the unique Tibetan culture and customs, the festivals in Tibet have their own characteristics which attract a great number of travelers in the world. Traveling to Tibet during the grand Tibetan festivals is the best way to learn about Tibetans and Tibetan history. With many years’ history of Buddhism, lots of traditional festivals in Tibet have a close relationship with Tibetan Buddhism. 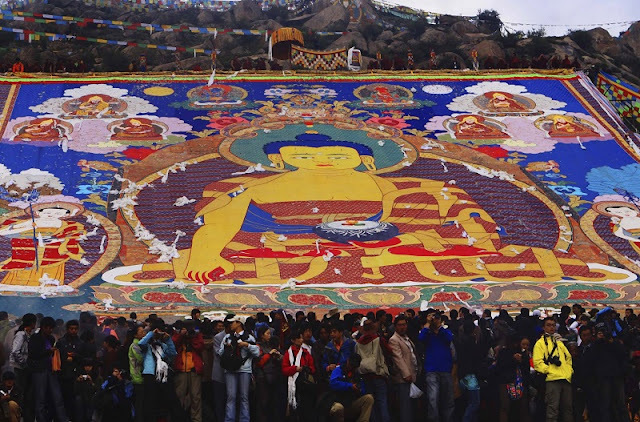 Today, let me guide you to have a wonderful Tibetan festival tour. As the most important festival in Tibet, Tibetan New Year is always held in the first month of Tibetan lunar calendar. The grand festival will last for a whole month. In the first day, all the Tibetans will head to Tibetan monasteries and temples to do pray for the purpose of seeking blessings from the Buddha. What Tibetan New Year is to Tibetans is what Christmas is to westerns. During this period, Tibetans will visit their relatives and friends, and share Tibetan food and wine with each other. Located in the northwest of Tibet, Nagqu Prefecture is famous for a famous festival - Nagqu Horse Racing Festival. It always held in August, and it will attract thousands of Tibetans and travelers. Before the day of Nagqu Horse Racing Festival, lots of Tibetans will arrive at the boundless grassland, and pitch tents in advance in order to pick up the best view place. Hundreds of tents will be settled in an overnight. There are kinds of activities and competitions held during the festival, such as horse racing, yak racing, lifting stones, and so on. Thus, you have no reason to miss such a grand visual feast in Nagqu. As one of the most vital festivals in Tibet, Saga Dawa Festival is held on the fourth mouth of Tibetan lunar calendar. As the main site for holding Saga Dawa Festival, Lhasa will host a great number of Tibetans from different prefectures. All the pious Tibetans will head to Potala Palace and Bharkor Street to do pray. According to Buddhism, Tibetans should avoid killing living things and eating meat during this month. Held on the sixth month, Shoton Festival is another popular festival in Tibet. The highlight of this festival is to display the huge Thangka of Lord Buddha in Drepung monastery. When the Thangka is lifted by monks, the horns will rise. As the opening of Thangka, all Tibetans will throw their hahas into the sky. After a week later, the Thangka will be reclosed and placed in Drepung monastery. Besides the unveiling of Thangka, there are some other activities such as eating yogurt, Tibetan Opera Performance, and Linkga activities. Held on the 15th day of the first month of Tibetan lunar calendar, Butter Lamp Festival is the representative festival of Buddhism religion. During that day, all Tibetan monks will use butter to create varies of Buddha statues. The colors of those statues are plenty and diverse. It will attract lots of Tibetans people to enjoy colorful sculptures.